The Introduction to this series of blogs, HERE, sets out the background and goals. There are many different senses in which people discuss ‘standards’. Sometimes they mean an overall judgement on the performance of the system as judged by an international test like PISA. Sometimes they mean judgements based on performance in official exams such as KS2 SATs (at 11) or GCSEs. Sometimes they mean the number of schools above or below a DfE ‘floor target’. Sometimes they mean the number of schools and/or pupils in Ofsted-defined categories. Sometimes people talk about ‘the quality of teachers’. Sometimes they mean ‘the standards required of pupils when they take certain exams’. Today, the media is asking ‘have Academies raised standards?’ because of the Select Committee Report (which, after a brief flick through, seems to have ignored most of the most interesting academic studies done on a randomised/pseudo-randomised basis). This blog in the series is concerned mainly with the questions of – what has happened to the standards required of pupils when they take GCSEs and A Levels as a result of changes since the mid-1980s, and how do universities and learned societies judge the preparation of pupils for further studies. Have the exams got easier? Do universities and learned societies think pupils are well-prepared for further studies? I will give a very short potted history of the introduction of GCSEs and the National Curriculum before examining the evidence of their effects. If you are not interested in the history, please skip to the Section B on Evidence. If you just want to see my Conclusions, scroll to the end for a short section. I stress that my goal is not to argue for a return to the pre-1988 system of O Levels and A Levels. While it had some advantages over the existing system, it also had profound problems. I think that an unknown fraction of the cohort could experience far larger improvements in learning than we see now if they were introduced to different materials in different ways, rather than either contemporary exams or their predecessors, but I will come to this argument, and why I have this belief, in a later blog. I have used the word ‘Department’ to represent the DES of the 1980s, the DfE of post-2010, and its different manifestations in between. This is just a rough first stab at collecting things I’ve shoved in boxes, emails etc over the past few years. Please leave corrections and additions in Comments. The debate over the whole of education policy, and particularly the curriculum and exams, changed a lot after Callaghan’s Ruskin speech in 1976 and the Department’s Yellow Book. Before then, the main argument was simply about providing school places and the furore over selection. After 1976 the emphasis shifted to ‘standards’ and there was growing momentum behind a National Curriculum (NC) of some sort and reforms to the exam system. Between 1979-85, the Department chivvied LAs on the curriculum but had little power and nothing significant changed. Joseph was too much of a free marketeer to support a NC so its proponents could not make progress. I have not come across any other ministers or officials from this period so open about their errors. The O Level survived under a different name as an international exam provided by Cambridge Assessment. It is still used abroad including in Singapore which regularly comes in the top three in all international tests. Cambridge Assessment also offers an ‘international GCSE’ that is, they say, tougher than the ‘old’ GCSE (i.e. the one in use now before it changes in 2015) but not as tough as the O Level. This international GCSE was used in some private schools pre-2010 along with ‘international GCSEs’ from other exam boards. From 2010, state schools could use iGCSEs. In 2014, the DfE announced that it would stop this again. I blogged on this decision HERE. Between 1976 and 1986, concern had grown in Whitehall about the large number of awful schools and widespread bad teaching. Various intellectual arguments, ideology, political interests (personal and party), and bureaucratic interests aligned to create a National Curriculum. Thatcherites thought it would undermine what they thought of as the ‘loony left’, then much in the news. Baker thought it would bring him glory. The Department and HMI rightly thought it would increase their power. After foolishly announcing CTCs at Party Conference, thus poisoning their brand with politics from the start, Baker announced he would create a NC and a testing system at 7, 11, and 14. The different centres of power disagreed on what form the NC would take. HMI lobbied against subjects and wanted a NC based on ‘areas of expertise’, not traditional subjects. Thatcher wanted a very limited core curriculum based on English, maths, and science. The Department wanted a NC that stretched across the whole curriculum. Baker agreed with the Department and dismissed Thatcher’s limited option as ‘Gradgrind’. The 1988 Act established two quangos to be what Baker called ‘the twin guardians of the curriculum’ – The National Curriculum Council (NCC), focused on the NC, and The Schools Examinations and Assessment Council (SEAC), focused on tests. Once the Act was passed, Baker’s junior minister Rumbold said that ‘Ken went out to lunch.’ Like many ministers, he did not understand the importance of the policy detail and the intricate issues of implementation. He allowed officials to control appointments to the two vital committees and various curriculum working groups. Even Baker’s own spad later said that Baker was conned into appointing ‘the very ones responsible for the failures we have been trying to put right’. Baker forlornly later admitted that ‘I thought you could produce a curriculum without bloodshed. Then people marched over mathematics. Great armies were assembled’, and he ‘never envisaged it would be as complex as it turned out to be’. Bacon, the official responsible for the NC, said that Baker ‘wasn’t interested in the nitty gritty’. Nicholas Tate (who was at the NCC and later headed the QCA) said that Baker was ‘affable but remote. He didn’t trouble his mind with attainment targets. He was resting on his laurels.’ Hancock, his Permanent Secretary, said that ‘after 1987 he became increasingly arrogant and impatient’. In 1989, Baker was moved to Party Chairman leaving behind chaos for his successor. MacGregor could not get a grip of the complexity. He did not even hire a specialist policy adviser because, he said, ‘I didn’t feel I needed one.’ He blamed Baker for the chaos who, he said, ‘hadn’t spent enough time thinking about who was appointed to the bodies. He left it to officials and didn’t think through what he wanted the bodies to do. For the first year I was unable to replace anybody.’ The chairman of NCC described how they used ‘magic words to appease the right’ and get through what they wanted. The officials who controlled SEAC stopped the simplification that Thatcher wanted using the ‘legal advice’ card, claiming that the 1988 Act required testing of all attainment targets. (I had to deal with the same argument 25 years later.) MacGregor was trapped. He had an unworkable system and was under contradictory pressure from Thatcher to simplify everything and from Baker to maintain what he had promised. Clarke bluffed and bullied his way through 18 months without solving the problems. His Permanent Secretary described the trick of getting Clarke to do what officials wanted: ‘The trick was to never box him into a corner… Show him where there was a door but never look at that door, and never let on you noticed when he walked through.’ Like MacGregor, Clarke blamed Baker for the shambles: ‘[Baker] had set up all these bloody specialist committees to guide the curriculum, he’d set up quango staff who as far as I could see had come out of the Inner London Education Authority the lot of them.’ Clarke solved none of the main problems with the tests, antagonised everybody, and replaced HMI with Ofsted. After his surprise win, Major told the Tory Conference in 1992, ‘Yes it will mean another colossal row with the education establishment. I look forward to that.’ Patten soon imploded, the unions went for the jugular over the introduction of SATs, and by the end of 1993 Number Ten had backtracked on their bellicose spin and was in full retreat with a review by Dearing (published 1994). Suddenly, the legal advice that had supposedly prevented any simplification was rethought and officials told Dearing that the legal advice did allow simplification after all: ‘our advice is that the primary legislation allows a significant measure of flexibility’. (In my experience, one of the constants of Whitehall is that legal advice tends to shift according to what powerful officials want.) Dearing produced a classic Whitehall fudge that got everybody out of the immediate crisis but did not even try to deal with the fundamental problems, thus pushing the problems into the future. The Government had introduced a new NC and test system and replaced O Levels with GCSEs. (They also introduced new vocational qualifications (NVQs) described by Professor Alan Smithers as a ‘disaster of epic proportions … utterly lightweight’.) The process was a disastrous bungle from start to finish. Thatcher deserves considerable blame. She allowed Baker to go ahead with fundamental reforms without any agreed aims or a detailed roadmap. She knew, as did Lawson, that Baker could not cope with details yet appointed him on the basis of ‘presentational flair’ (media obsession is often confused with ‘presentational flair’). Arguably the person who knowingly appoints someone like Baker is more to blame for the failings of Baker than Baker is himself. Major and the string of ministers that followed Baker were doomed. They were not unusually bad – they were representative examples of those at the apex of the political process. They did not know how to go about deciding aims, means, and operations. They were obsessed with media management and therefore continually botched the policy and implementation. They could not control their officials. They could not agree a plan and blamed each other. If they were the sort of people who could have got out of the mess, then they were the sort of people who would not have got into the mess in the first place. Officials over-complicated everything and, like ministers, did not engage seriously with the core issue – what should pupils of different abilities be doing and how can we establish a process where we can collect reliable information. The process was dominated by the same attitude on all sides – how to impose a mentality already fixed. It was also clearly affected by another element that has contemporary relevance – the constant churn of people. Just between summer 1989 and the end of 1992, there was: a new Permanent Secretary in May 1989, a new SoS in July 1989 (MacGregor), another new SoS in November 1990 (Clarke), a new PM and No10 team (Major), new heads for the NCC and SEAC in July 1991, then another new SoS in spring 1992 (Patten) and another new Permanent Secretary. Everybody blamed problems on predecessors and nobody could establish a consistent path. A central irony of the story shows how dysfunctional the system was. Thatcher never wanted a big NC and a complicated testing system but she got one. As some of her ideological opponents in the bureaucracy tried to simplify things when it was clear Baker’s original structure was a disaster, ministers were often fighting with them to preserve a complex system that could not work and which Thatcher had never wanted. This sums up the basic problem – a very disruptive process was embarked upon without the main players agreeing what the goal was. Although the think tanks were much more influential in this period than they are now, Ferdinand Mount, head of Thatcher’s Policy Unit, made a telling point about their limitations: ‘Enthusiasts for reform at the IEA and the CPS were prodigal with committees and pamphlets but were much less helpful when it came to providing practical options for action. This made it difficult for the Policy Unit’s ideas to overcome the objections put forward by senior officials’. Thirty years later this remains true. Think tanks put out reports but they rarely provide a detailed roadmap that could help people navigate such reforms through the bureaucracy and few people in think tanks really understand how Whitehall works. This greatly limits their real influence. This is connected to a wider point. Few of those who comment prominently on education (or other) policy understand how Whitehall works, hence there is a huge gap between discussions of ideal policy and what is actually possible within a certain timeframe in the existing system, and commentators think that all sorts of things that happen do so because of ministers’ wishes, confusing public debate further. I won’t go into the post-1997 story. There are various books that tell this whole story in detail. The National Curriculum remained but was altered; the test system remained but gradually narrowed from the original vision; there were some attempts at another major transformation (such as Tomlinson’s attempt to end A Levels, thwarted by Blair) but none took off; money poured into the school system and its accompanying bureaucracy at an unprecedented rate but, other than a large growth in the number and salaries of everybody, it remained unclear what if any progress was being made. This bureaucracy spent a great deal of taxpayers’ money promoting concepts such as ‘learning styles’ and ‘multiple intelligences’ that have no proper scientific basis but which nevertheless were successfully blended with old ideas from Vygotsky and Piaget to dominate a great deal of teacher training. A lot of people in the education world got paid an awful lot of money (Hargreaves, Waters et al) but what happened to standards? Below I consider 1) the data on grade inflation in GCSEs and A Levels, 2) various studies from learned societies and others that throw light on the issue, 3) knock-on effects in universities. We do not have an official benchmark against which to compare GCSE results. The picture is therefore necessarily hazy. As Coe has written, ‘we are limited by the fact that in England there has been no systematic, rigorous collection of high-quality data on attainment that could answer the question about systemic changes in standards.’ This is one of the reasons why in 2013 we, supported by Coe and others, pushed through (against considerable opposition including academics at the Institute of Education) a new ‘national reference test’ in English and maths at age 16, which I will return to in a later blog. However, we can compare the improvement in GCSE results with a) results from international tests and b) consistent domestic tests uncontrolled by Whitehall. The first two graphs below show the results of this comparison. Chart 2 plots the improving GCSE grades achieved by pupils scoring the same each year in a test of maths and vocabulary: pupils scoring the same on YELLIS get higher and higher GCSE grades as time passes. Coe concludes that although ‘it is not straightforward to interpret the rise in grades … as grade inflation’, the YELLIS data ‘does suggest that whatever improved grades may indicate, they do not correspond with improved performance in a fixed test of maths and vocabulary’ (Coe, ibid). 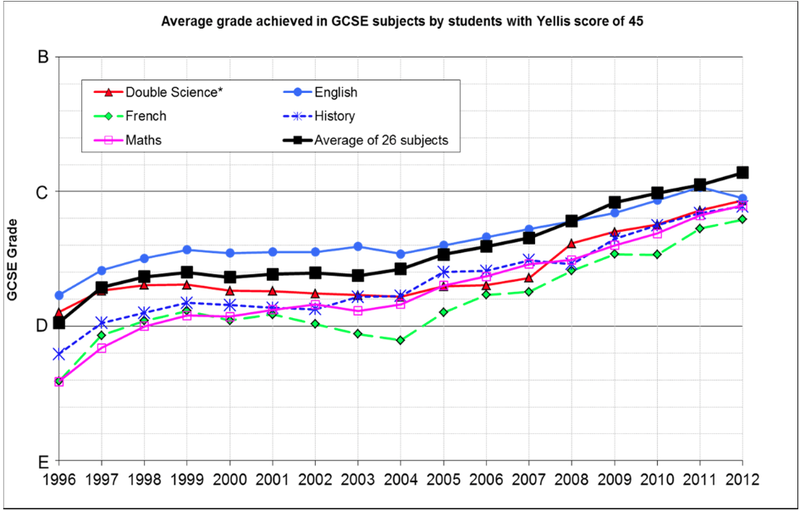 This YELLIS comparison suggests that in 2012 pupils received a grade higher in maths, history, and French GCSE, and almost a grade higher in English, than students of the same ability in 1996. 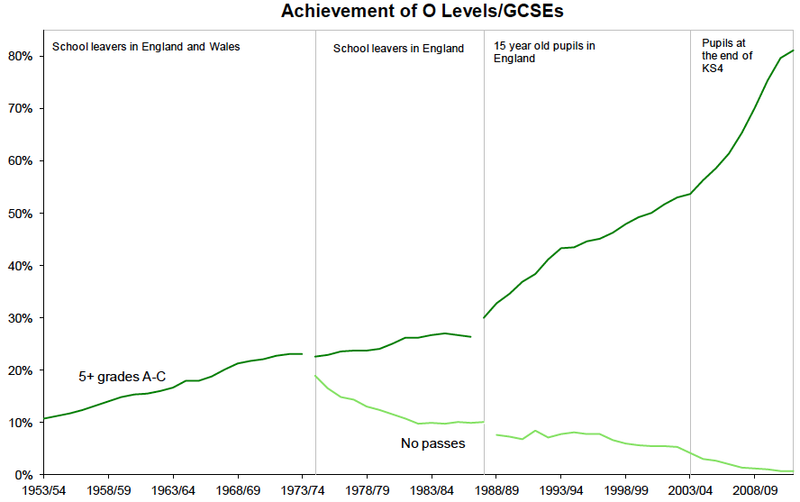 It is important to note that neither of Coe’s charts or measurements include the effects of either a) the initial switch from O Level to GCSE or b) what changed with GCSEs from 1988 – 1995. The next two charts show this earlier part of the story (both come from Education: Historical statistics, House of Commons, November 2012). NB. they have different end dates. Chart 3 shows that the period 1988-95 saw an even sharper increase in GCSE scores than post-1995 so a GCSE/YELLIS style comparison that included the years 1988-1995 would make the picture even more dramatic. 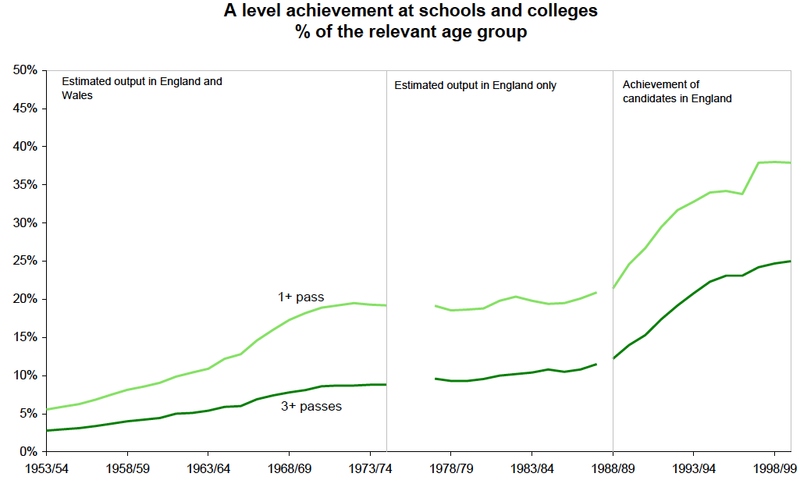 Chart 4 shows a dramatic increase in A Level passes after the introduction of GCSEs. One interpretation of this graph, supported by the 1997-2010 Government and teaching unions, is that this increase reflected large real improvements in school standards. There is GCSE data that those who believe this argument could cite. In 1988, 8% of GCSEs were awarded an ‘A’ in GCSE. In 2011, 23% of GCSEs were awarded an ‘A’ or ‘A*’ in GCSE. The DfE published data in 2013 which showed that the number of pupils with ten or more A* grades trebled 2002-12. This implies a very large increase in the numbers of those excelling at GCSE, which is consistent with a picture of a positive knock-on effect on improving A Level results. However, we have already seen that the claims for GCSEs are ‘not believable’ in Coe’s words. It also seems prima facie very unlikely that a sudden large improvement in A Level results from 1990 could be the result of immediate improvements in learning driven by GCSEs. There is also evidence for A Levels similar to the GCSE/YELLIS comparison. 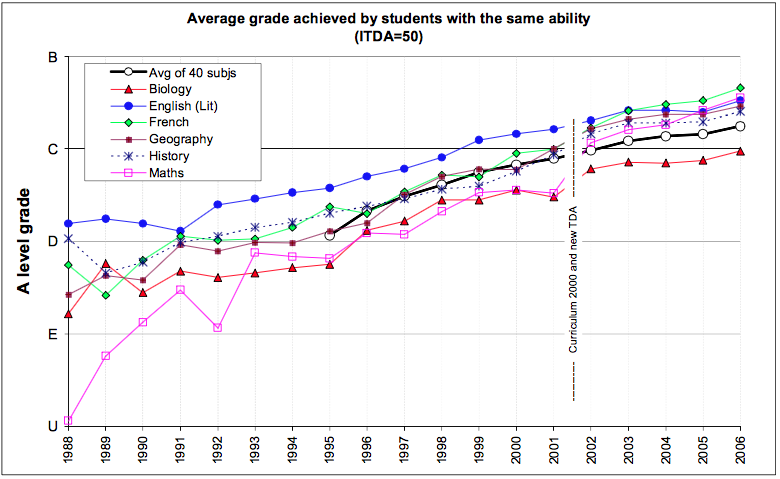 Chart 5 plots A Level grades in different subjects against the international TDA test. As with GCSEs, this shows that pupils scoring the same in a non-government test got increasingly higher grades in A Levels. The change in maths is particularly dramatic from an ‘Unclassified’ mark in 1988 to a B/C in 2006. What we know about GCSEs combined with this information makes it very hard to believe that the sudden dramatic increase in A Level performance since 1990 is because of real improvements and suggests another interpretation: these dramatic increases in A Level results reflected (mostly or entirely) A Levels being made significantly easier probably in order to compensate for GCSEs being much easier. However, the data above can only tell part of the story. Logically, it is hard or impossible to distinguish between possible causes just from these sorts of comparisons. For example, perhaps someone might claim that A Level questions remained as challenging as before but grade boundaries moved – i.e. the exam papers were the same but the marking was easier. I think this is prima facie unlikely but the point is that logically the data above cannot distinguish between various possible dynamics. Below is a collection of studies, reports, and comments from experts that I have accumulated over the past few years that throws light on which interpretation is more reasonable. Please add others in Comments. NB1. Most of these studies are comparing changes over the past decade or so, not the period since the introduction of the NC and GCSEs in the 1980s. NB2. I will reserve detailed discussion of the AS/A2/decoupling argument for a later blog as it fits better in the ‘post-2010 reforms’ section. ‘For biology, chemistry and physics, it was felt there were underpinning areas of mathematics missing from the requirements and that their exclusion meant students were not adequately prepared for progression in that subject. For example, for physics many of the respondents highlighted the absence of calculus, differentiation and integration, in chemistry the absence of calculus and in biology, converting between different units… For biology, chemistry and physics, the analysis showed that the mathematical requirements that were assessed concentrated on a small number of areas (e.g. numerical manipulation) while many other areas were assessed in a limited way, or not at all… Survey respondents were asked to identify content areas from the mathematical requirements that should feature highly in assessments. In most cases, the biology, chemistry and physics respondents identified mathematical content areas that were hardly or not at all assessed by the awarding organisations. ‘The current mathematical assessments in science A-levels do not accurately reflect the mathematical requirements of the sciences. The findings show that a large number of mathematical requirements listed in the biology, chemistry and physics specifications are assessed in a limited way or not at all within these papers. The mathematical requirements that are assessed are covered repeatedly and often at a lower level of difficulty than required for progression into higher education and employment. It has also highlighted a disparity between awarding organisations in their assessment of the use of mathematics within biology, chemistry and physics A-level. This is unacceptable and the examination system, regardless of the number of awarding organisations, must ensure the assessments provide an authentic representation of the subject and equip all students with the necessary skills to progress in the sciences. ‘This is likely to have an impact on the way that the subjects are taught and therefore on students’ ability to progress effectively to STEM higher education and employment.’ SCORE, 2012. Emphasis added. The 2011 Institute of Physics report showed strong criticism from university academics of the state of physics and engineering undergraduates’ mathematical knowledge. Four-fifth of academics said that university courses had changed to deal with a lack of mathematical fluency and 92% said that a lack of mathematical fluency was a major obstacle. ‘Academics perceived a lack of crossover between mathematics and physics at A-level, which was felt to not only leave students unprepared for the amount of mathematics in physics, but also led to them not applying their mathematical knowledge to their learning of physics and engineering.’ IOP, 2011. On A-levels, ‘In general we found that changes to the way the content was assessed had an impact on demand, in many cases reducing it. In two of the reviews (biology and chemistry) the specifications were the same for both years. We found that the demand in 2008 was lower than in 2003, usually because the structure of the assessments had changed. Often there were more short answer, structured questions’ (Ofqual, Standards Reviews – A Summary, 1 May 2012, found here). Chief Executive of Ofqual, Glenys Stacey, has said: ‘If you look at the history, we have seen persistent grade inflation for these key qualifications for at least a decade… The grade inflation we have seen is virtually impossible to justify and it has done more than anything, in my view, to undermine confidence in the value of those qualifications’ (Sunday Telegraph, 28 April 2012). 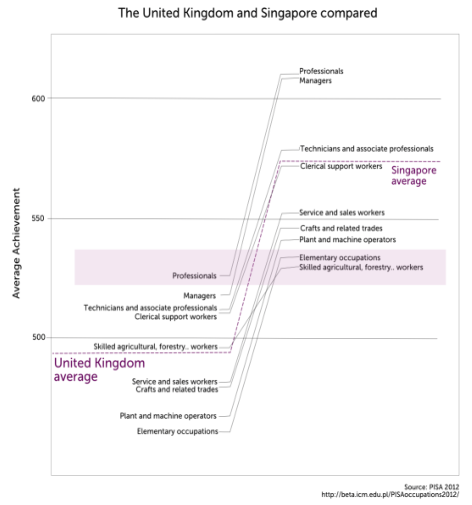 The OECD’s International Survey of Adult Skills (October 2013). This assessed numeracy, literacy and computing skills of 16-24-year-olds. The tests were done over 2011/2012. England was 22nd out of 24 for literacy, 21st out of 24 for numeracy, and is 16th out of 20 for ‘problem solving in a technology-rich environment’. PISA 2012. The normal school PISA tests taken in 2012 (reported 2013) showed no significant change between 2009-12. England was 21st for science, 23rd for reading, and 26th for mathematics. 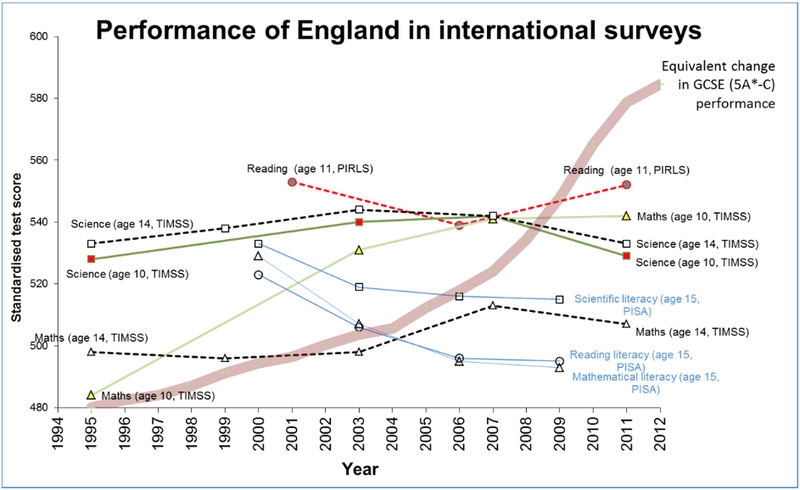 A 2011 OECD report concluded: ‘Official test scores and grades in England show systematically and significantly better performance than international and independent tests… [Official results] show significant increases in quality over time, while the measures based on cognitive tests not used for grading show declines or minimal improvements’ (OECD Economic Surveys: United Kingdom, 16 March 2011, p. 88-89). This interesting chart shows that in the PISA maths test the children of English professionals perform the same as children of Singapore cleaners (Do parents’ occupations have an impact on student performance?, PISA 2014). King’s College, 2009. A major study by academics from King’s College London and Durham University found that basic skills in maths have declined since the 1970s. In 2008, less than a fifth of 14 year-olds could write 11/10 as a decimal. In the early 1980s, only 22 per cent of pupils obtained a GCE O-level grade C or above in maths. In 2008, over 55 per cent gained a GCSE grade C or above in the subject (King’s College London/University of Durham, ‘Secondary students’ understanding of mathematics 30 years on‘, 5 September 2009, found here). Tymms (2007) reviewed assessment evidence in mathematics from children at the end of primary school between 1978 and 2004 and in reading between 1948 and 2004. The conclusion was that standards in both subjects ‘have remained fairly constant’. Warner (2013) on physics. Professor Mark Warner (Cambridge University) produced a fascinating report (2013) on problems with GCSE and A Level Physics and compared the papers to old O Levels, A Levels, ‘S’ Level papers, Oxbridge entry exams, international exams and so on. After reading it, there is no room for doubt. The standards demanded in GCSEs and A Levels have fallen very significantly. For example, the mechanics problems in GCSE Physics are substantially shallower than those in 1980s O Level, which examined concepts now in A Level. The removal of calculus from A Level physics badly undermined it. Calculus is tested in A Level Maths’ Mechanics I paper and Mechanics II and III test deeper material than Physics A Level. This is one of the reasons why Cambridge Physics department stopped requiring Physics A Level for entry and made clear that Further Maths A Level is acceptable instead (many say it is better preparation for university than physics A Level is). Durham University analysis gives data to quantify this conclusion. 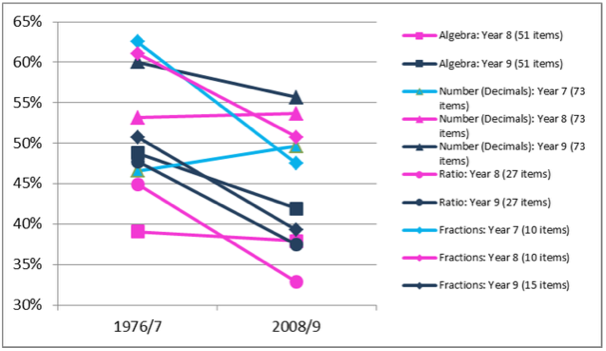 Pupils who would have received a U (unclassified) in Maths A-Level in 1988 received a B/C in 2006 – see above for Chart 5 showing this (CEM Centre Durham University, Changes in standards at GCSE and A-Level: Evidence from ALIS and YELLIS, April 2007). Further Maths A Level is supposedly the toughest A Level and probably it is but a) it is not the same as its 1980s ancestor and b) it now introduces pupils to material such as matrices that used to be taught in good prep schools. The Royal Society estimated (Mathematical Needs, 2012) that about 300,000 per year need a post-GCSE Maths course but only ~100,000 do one. (This may change thanks to Core Maths starting in 2015, see later blog.) This House of Lords report (2012) on Higher Education in STEM subjects concluded: ‘We are concerned that … the level at which the subject [maths] is taught does not meet the requirements needed to study STEM subjects at undergraduate level… [W]e urge HEIs to introduce more demanding maths requirement for admissions into STEM courses as the lack, or low level, of maths requirements at entry acts as a disincentive for pupils to study maths and high level maths at A level.’ House of Lords Select Committee on Science and Technology, Higher Education in STEM subjects, 2012. Further, though this subject is beyond the scope of this blog, it is also important that the maths PhD pipeline ‘which was already badly malfunctioning has been seriously damaged by EPSRC decisions’, including withdrawal of funding from non-statistics subjects which drew the ire of UK Fields Medallists, cf. Submission by the Council for the Mathematical Sciences to the House of Lords, 2011. The weaknesses in biology also feed into the bioscience pipeline: only six percent of bioscience academics think their graduates are well prepared for a masters in the fast-growing field of Computational Biology (p.8 of report). The same picture applies to classical languages. Already by 1994 the Oxford Classics department was removing texts such as Thucydides as compulsory elements in ‘Greats’ because they were deemed ‘too hard’. These changes continued and have made Classics a very different subject than it was before 1990. At Oxford, they introduced whole new courses (Mods B then Mods C) that do not require any prior study of the ancient languages themselves. The first year of Greats now involves remedial language courses. I quote at length from a paper by John Davie, a Lecturer in Classics at Trinity College, Oxford, as his comments summarise the views of other senior classicists in Oxbridge and elsewhere who have been reluctant to speak out (In Pursuit of Excellence, Davie, 2013). Inevitably, the problems described are damaging the pipeline for masters, PhDs, and future scholarship. ‘[W]e have, in GCSE, an exam that insults the intelligence… Recent changes to this exam have by general consent among teachers made the papers even easier. ‘In the AS exam currently taken at the end of the first year of A-level … students study two small passages of literature, which represent barely a third of an original text. They are asked questions so straightforward as to verge on the banal and the emphasis is on following a prescribed technique of answering, as at GCSE. Imagination and independent thought are simply squeezed out of this process as teachers practise exam-answering technique in accordance with the narrow criteria imposed on examiners. ‘At A2 … students read less than a third of a literary text they would formerly have read in its entirety. ‘There is the added problem that young teachers entering the profession are themselves products of the modernist approach and so not wholly in command of the classical languages themselves. As a result they welcome the fact that they are not required by the present system to give their pupils a thorough grounding in the language, embracing the less rigorous approach of modern course-books with some relief. ‘In the majority of British universities Classics in its traditional form has either disappeared altogether or has been replaced by a course which presents the literature, history and philosophy mainly (or entirely) in translation, i.e. less a degree course in Classics than in Classical Civilisation. ‘Even at Oxford cuts have been made to the number of texts students are required to read and, in those texts that remain, not as many lines are prescribed for reading in the original Latin or Greek. ‘GCSE should be replaced by a modern version of the O-level that stretches pupils… This would make the present AS exam completely unsuitable, and either a more challenging set of papers should be devised, if the universities wish to continue with pre A-level interviewing, or there should be a return to an unexamined year of wide reading before the specialisation of the last year. This combination of problems explains why we funded a project with Professor Pelling, Regius Professor of Greek at Oxford, to fund teacher training and language enrichment courses for schools. I will not go into other humanities subjects. I read Ancient & Modern History and have thoughts about it but I do not know of any good evidence similar to the reports quoted above by the likes of the Royal Society. I have spoken to many university teachers. Some, such as Professor Richard Evans (Cambridge) told me they think the standard of those who arrive as undergraduates is roughly the same as twenty years ago. Others at Oxbridge and elsewhere told me they think that essay writing skills have deteriorated because of changes to A Level (disputed by Evans and others) and that language skills among historians have deteriorated (undisputed by anyone I spoke to). ‘Bogus educational theories have done so much to damage education in this country… The effects are visible even in a great university such as Cambridge, with a steady decline in standards of literacy, and with, in consequence, the provision in one college after another of ‘skills teaching’, so that students who no longer arrive knowing how to structure an essay or even read a book can receive appropriate ‘training’… Even students from top ranked schools seem to find it very difficult … to write essays coherently… In the sort of exams I am thinking of, essay writing comes much more to the fore and examiners would be making more subjective judgements about scripts. In an ideal world there would be double marking of scripts.’ Emphasis added. Judging essay skills is a more nebulous task than judging the quality of mechanics questions. Also, there is less agreement among historians about the sort of things they want to see in school exams compared to mathematicians and physicists who largely (in my experience, I stress, which is limited) agree about the sorts of problems they want undergraduates to be able to solve and the skills they want them to have. If anybody knows of studies on history and other humanities please link in Comments below. As political arguments increasingly focused on ‘participation’ and ‘access’, Oxford and Cambridge largely abandoned their own entrance exams in the 1990s. There were some oddities. Cambridge University dropped their maths test and were so worried by the results that they immediately asked for and were given special dispensation to reintroduce it and they have used one since (now known as the STEP paper, used by a few other universities). Other Cambridge departments who wanted to do the same were refused permission and some of them (including the physics department) now use interviews to test material they would like to test in a written exam. Oxford changed its mind and gradually reintroduced admission tests in some subjects. (E.g. It does not use STEP in maths but uses its own test which has more ‘applied’ maths.) Cambridge now uses AS Levels. Oxford does not (but does not like to explain why). A Levels are largely useless for distinguishing between candidates in the top 2% of ability (i.e. two standard deviations above average). Oxbridge entry now involves a complex and incoherent set of procedures. Some departments use interviews to test skills that are i) either wholly or entirely untested by A Levels and ii) are not explicitly set out anywhere. For example, if you go to an interview for physics at Cambridge, they will ask you questions like ‘how many photons hit your eye per second from Alpha Centauri?’ – i.e. questions that you cannot cram for but from which much information can be gained by tutors watching how students grapple with the problem. The fact that the real skills they want to test are asked about in interviews rather than in public exams is, in my opinion, not only bad for ‘standards’ but is also unfair. Rich schools with long connections to Oxbridge colleges have teachers who understand these interviews and know how to prepare pupils for them. They still teach the material tested in old exams and other materials such as Russian textbooks created decades ago. A comprehensive in east Durham that has never sent anybody to Oxbridge is very unlikely to have the same sort of expertise and is much more likely to operate on the very mistaken assumption that getting a pupil to three As is sufficient preparation for Oxbridge selection. Testing skills in open exams that everybody can see would be fairer. I will return to this issue in a later blog but it is important to consider the oddities of this situation. Decades ago, open public standardised tests were seen as a way to overcome prejudice. For example, Ivy League universities like Harvard infamously biased their admissions system against Jews because a fair open process based on intellectual abilities, and ignoring things like lacrosse skills, would have put more Jews into Harvard than Harvard wanted. Similar bias is widespread now in order to keep the number of East Asians low. It is no coincidence that Caltech’s admissions policy is unusually based on academic ability and it has a far higher proportion of East Asians than the likes of Harvard. Similar problems apply to Oxbridge. A consequence of making exams easier and removing Oxbridge admissions tests was to make the process more opaque and therefore biased against poorer families. The fascinating journey made by the intellectual Left on the issue of standardised tests is described in Steven Pinker’s recent influential essay on university admissions. I agree with him that a big part of the reason for the ‘madness’ is that the intelligentsia ‘has lost the ability to think straight about objective tests’. Half a century ago, the Left fought for standardised tests to overcome prejudice, now many on the Left oppose tests and argue for criteria that give the well-connected middle classes unfair advantages. This combination of problems is one of the reasons why the Cambridge pure maths department and physics department worked with me to develop projects to redo 16-18 curricula, teacher training, and testing systems. Cambridge is even experimenting with a ‘correspondence Free School’ idea proposed by the mathematician Alexander Borovik (who attended one of the famous Russian maths schools). Powerful forces tried to stop these projects happening because they are, obviously, implicit condemnations of the existing system – condemnations that many would prefer had never seen the light of day. Similar projects in other departments at other universities were kiboshed for the same reason, as were other proposals for specialist maths schools as per the King’s project (which also would never have happened but for the determination of Alison Wolf and a handful of heroic officials in the DfE). I will return to this too. Here are some tentative conclusions. The political and bureaucratic process for the introduction of the GCSE and National Curriculum was a shambles. Those involved did not go through basic processes to agree aims. Implementation was awful. All elements of the system failed children. There are important lessons for those who want to reform the current system. Given the weight of evidence above, it is hard to avoid the conclusion that GCSEs were made easier than O Levels and became easier still over time. This means that at least the top fifth are aimed aged 14 at lower standards than they would have been aimed at previously (not that O Levels were at all optimal). Many of them spend two years with low grade material and repeating boring drills, in order that the school can maximise its league table position, instead of delving deeper into subjects. Inflation seems to have stopped in the last two years, perhaps temporarily, but by the use of an Ofqual system known as ‘comparable outcomes’ which is barely understood by anybody in the school system or DfE. The old ‘S’ level papers, designed to stretch the best A Level students, were abandoned which contributed to a decline of standards aimed for among the top 5%. University degrees in some subjects therefore also had to become easier (e.g. 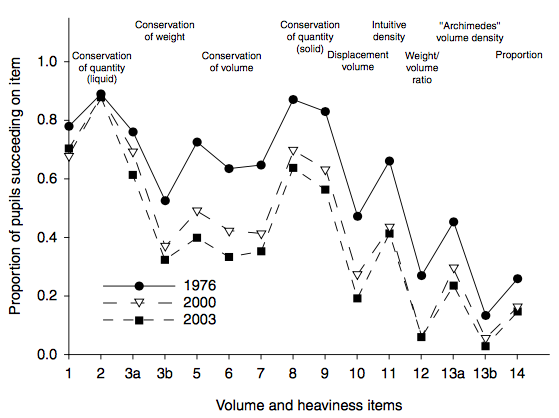 classics) or longer (natural sciences) in order to avoid increases in failure rates. This happened in some subjects even in elite universities. Remedial courses spread, even in elite universities, to teach/improve skills that were previously expected on arrival (including Classics at Oxford and History at Cambridge). Not all of the problems are because of failures in schools or easier exams. Some are because universities themselves for political reasons will not make certain requirements of applicants. Even if the exam system were fixed, this would remain a big problem. On the other hand, while publicly speaking out for AS Levels, admissions officers also, very quietly, have been gradually introducing new, non-Government/Ofqual regulated, tests for admissions purposes. On this, it is more useful to watch what universities do than what they say. These problems have cascaded right through the system and now affect the pipeline into senior university research positions in maths, sciences, and languages. For example, the lack of maths skills among biologists is hampering the development of synthetic biology and computational biology. It is very common now to have (private) discussions with scientists deploring the decline in English research universities. Just in the past few weeks I have had emails from an English physicist now at Harvard and a prominent English neuroscientist giving me details of these developments and how we are falling further behind American universities. As they say, however, nobody wants to speak out. It is much easier to see what has happened at the top end of the ability curve, where effects show up in universities, than it is for median pupils. The media also focuses on issues at the top end of the ability curve, A Levels, and the Russell Group. Because politicians took control of the system and used results to justify their own policies, and because they control funding, debate over standards became thoroughly dishonest, starting with the Conservative government in the 1980s and continuing to now when academics are pressured not to speak out by administrators for fear of politicians’ responses. When governments are in control of the metrics according to which they are judged, there is likely to be dishonesty. If people – including unions, teachers, and officials – claim they deserve more money on the basis of metrics that are controlled by a small group of people operating an opaque process and controlling the regulator themselves, there is likely to be dishonesty. An important caveat. It is possible that simultaneously a) 1-8 is true and b) the school system has improved in various ways. What do I mean? GCSEs are significantly easier than O Levels. Nevertheless, the switch to GCSEs also involved many comprehensives and secondary moderns dropping the old idea that maybe only a fifth of the cohort are ‘academic’ – the idea from Plato’s Republic of gold, silver, and bronze children, that influenced the 1944 Act. Instead, more schools began to focus more pupils on academic subjects. Even though the standards demanded were easier than in the pre-1988 exams, this new focus (combined with other things) at least led between 1988 and now to a) a reduction in the number of truly awful schools and b) more useful knowledge and skills at least for the bottom fifth of the cohort (in ability terms), and perhaps for more. Perhaps the education of median ability pupils stayed roughly the same (declining a bit in maths) hence the consistent picture in international tests, the King’s results comparing maths in 1978/2008, Shayer’s results and so on (above). Meanwhile the standards demanded by post-1988 A Levels clearly fell (at least in some vital subjects), as the changes in universities testify, and S Level papers vanished, so the top fifth of the cohort (and particularly the +2 standard deviation population, i.e. the top 2%) leave school in some subjects considerably worse educated than in the 1980s. (Given most scientific and technological breakthroughs come from among this top 2% this has a big knock-on effect.) Private schools felt incentivised to perform better than state schools on easier GCSEs and A Levels rather than pursue separate qualifications with all the accompanying problems. There remains no good scientific data on what children at different points on the ability curve are capable of achieving given excellent teaching so the discussion of ‘standards’ remains circular. Easier GCSEs and A Levels are consistent with some improvements for the bottom fifth, roughly stability for the median, significant decline for the top fifth, and fewer awful schools. This is coherent. It fits the evidence sketched above. In the next blog in this series I will consider issues of ‘ability’ and the circularity of the current debate on ‘standards’. If people accept the conclusions about GCSEs and A Levels (at least in maths, sciences, and languages, I stress again) how should this evidence be weighed against the very strong desire of many in the education system (and Parliament and Whitehall) to maintain a situation in which the vast majority of the cohort are aimed at GCSEs (or international equivalents that are not hugely different) and, for those deemed ‘academic’, A Levels? Do the gains from this approach outweigh the losses for an unknown fraction of the ‘more able’? Is there a way to improve gains for all points on the ability distribution? I have been told that there is no grade inflation in music exams. Is this true? If YES, is this partly because they are not regulated by the state? Are there other factors? Has A Level Music got easier? If not why not? What sort of approaches should be experimented with instead of the standard approaches seen in O Levels, GCSEs, and A Levels? What can be learned from non-Government regulated tests such as Force Concepts Tests (physics), university admissions tests, STEP, IQ tests and so on? What are the best sources on ‘S’ Level papers and what happened with Oxbridge entrance exams? What other evidence is there? Where are analyses similar to Warner’s on physics for other subjects? What evidence is there for university grade inflation which many tell me is now worse than GCSEs and A Levels?